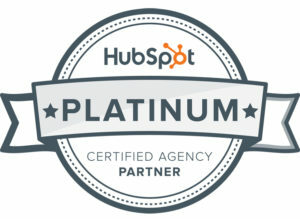 Did you know that Raka is a Certified Platinum HubSpot Partner? Our inbound marketing team has been using HubSpot since 2012 to manage inbound marketing for our clients and for Raka. HubSpot is an advanced inbound marketing platform and marketing automation software that lets us manage nearly all elements of a company’s online presence from one unified dashboard. As traditional outbound marketing techniques (think telemarketing, radio ads, commercials, and print mailers) go the way of the dinosaur, online marketers like us need smart tools to create the best inbound marketing campaigns possible. Inbound marketing is how businesses connect with their customers on the Internet. Essentially, it involves creating content or resources to solve a prospect’s challenges and engaging with them via email and social media as a means to build trust and brand awareness. When a prospect is ready to buy, chances are they’ll purchase from an organization with whom they already have a relationship. If you’ve been doing inbound marketing right, hopefully, that organization is you! Using HubSpot as a one of our technology tools, Raka leverages our digital agency creativity to write blog posts, plan and monitor campaigns, send and manage email newsletters, create and track calls-to-action (CTAs) and landing pages, and view detailed analytics like keyword and page performance all from the same place. HubSpot also lets us monitor your social accounts and, if your site is incorporated with their CMS or COS, update dynamic elements on your website. What is the HubSpot Partner Certification? Our status as a certified HubSpot partner agency lets the world know we’re skilled HubSpot administrators. Each of HubSpot’s certifications requires extensive training, skills evaluation, and practical abilities assessments. In order to qualify for the HubSpot Partner Certification, the Raka team first needed to demonstrate expertise in both general inbound marketing methodology, and proficiency using HubSpot’s proprietary inbound marketing automation platform, each of which came with certifications of their own (the Inbound Certification and the HubSpot Certification, respectively). Only after passing both could we apply for partner certification, which requires ten additional partner-level training classes and completion of the Partner Certification exam. Our HubSpot Partner Certification not only verifies proficiency and demonstrated ability creating and maintaining campaigns using HubSpot, but it also means we’re eligible to participate in HubSpot’s Tiers Program and Services Marketplace. What does our Certified HubSpot Partner thingy mean for you? It means we’ve got the inbound marketing skills to help your business reach more prospects, generate more leads, and ultimately, close more deals. It also means enhanced exposure and resources for our agency, and by extension, our clients.